If you’re curious who the red-head is in the last panel, he’s Azrael. I was hoping the hair would give him away, but it is his first time in color. Azrael almost wasn’t a red-head since the Valkyrie Sisters are sporting that orange-ish red that Driver shares, but I decided to keep it. So now we’ve got a more auburn red-head among the cast. I’m enjoying everyone’s expressions in this–Wiglaf looking annoyed, Mordred’s cunning little grin, and Brat sporting an expression that makes her look supremely confident. Very cool. First appearance of Azrael. I’m not sure he’s the best man to be assisting Mordred; he’s kind of reckless and could mess things up. Wiglaf could pulverize Azrael, no question. What is this? Some sort of test Mordred’s conducting? *Shudders. * Mordred looks creepy with a sleazy grin on his face like that. So Mordred confided in his brother enough to get Arthur to lend Azrael. Interesting. >_< Wiglaf looks more feminine to me with this short hair thing he has going on, now. I keep seeing a phantom red hibiscus flower at his temple. And Blackford’s def. correct about Azrael. That man has no good track record on report. Azrael officially reminds me of Kurama appearance-wise now. 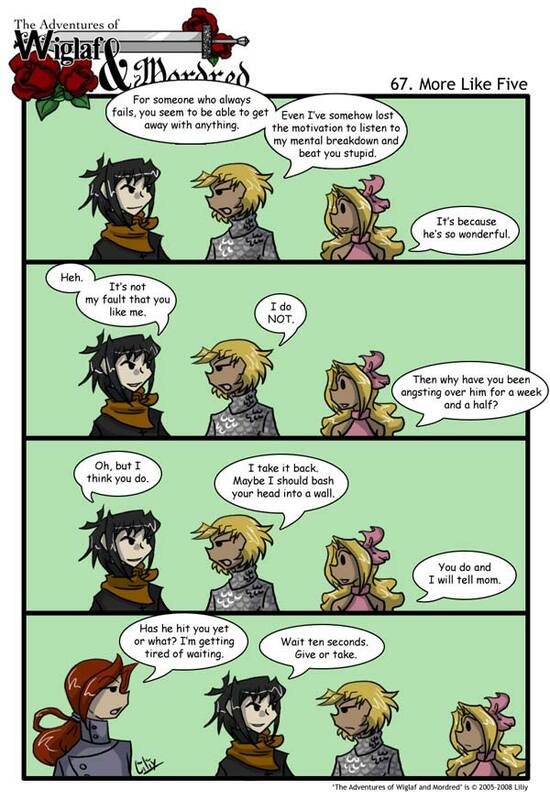 XD I love the last panel. Mordred looks so pleased with himself at the prospect of provoking Wiglaf into hitting him and thereby beaten up (well, in a fight) with Azrael. Yaknow when I first read it,it didn’t make sense. That said, this is one of my fav webcomics. Ahaha. Thank you!